The City of Chicago has worked hard and invested heavily in promoting bicycle commuting and its efforts are paying off. Over the last eight years since the Bike 2015 Plan was started in 2006, there has been a conscious and targeted effort made to increase Chicago bicycle commuting and bicycle riding in general. According to the U.S. Census numbers, from just 2011 to 2012, the amount of Chicago residents that commuted by bike to work increased almost 14%, showing that the investment in promoting this healthy and environmentally-friendly transportation has made a difference. If you or a loved one was injured while riding your bike to work contact our office for a free case review. Our Chicago bicycle accident lawyers are committed to holding negligent drivers fully accountable when their negligence results in a crash and subsequent injuries to cyclists on their way to work. As with all of our bike accident cases, we represent injured bike commuters on a contingency fee basis where there is never a legal fee charged unless there is a financial recovery for you. This initial plan, along with the subsequent Chicago Streets for Cycling 2020, have had an impact. There has been more awareness and advocacy for bicycle commuting and riding as well as some major changes to the City of Chicago to make room for more bicyclists on the streets. Bike lanes. So far over 200 miles of bike lanes have been added throughout the streets of Chicago, with a goal of over 645 miles by 2020. Divvy. The new Divvy program added in 2013 gave the convenience of 400 bike share or rental stations with over 4,000 available bikes for commuting. Dooring laws. It became illegal to open a door into traffic, protecting bicyclists from dangerous dooring accidents. It is an accumulation of all these investments in both advocacy for cycling as well as the actual physical investments that are helping increase the amount of commuters in the city. With almost 20,000 residents in Chicago commuting the largest portion of the distance to work on bicycles in 2012, it seems to be a worthy investment. That is a potential of 20,000 fewer vehicles clogging up the roadways every day as well as a reduction in pollution and waste of natural resources. Many may not have believed Chicago’s lofty bicycle plan would be as successful as it has proven to be. With more improvements still planned, it will be interesting to see how many Chicagoan’s are leaving their cars at home and straddling their bikes to get to work in the next few years. Are You an Injured Bicycle Commuter? 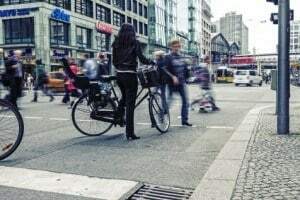 Rosenfeld Injury Lawyers LLC appreciates the dangers bicycle commuters in the Chicagoland area face everyday as they share streets with drivers who are unfamiliar with the traffic layout or just ignore their legal obligations to cyclists sharing the road. Our office remains committed to bicycle safety in Chicago and regularly sponsors local bicycle event. If you are in need of legal representation following an bike accident, contact our office for a free case evaluation. We are here to serve you.